I always applaud the dog parents who lace up their sneakers and head outside for a walk despite the rain, snow, or undesirable temperatures. Good for them braving the elements. Me? I prefer to stay indoors and wait for the sun to reappear. If bad weather keeps you inside too then the following six activities will really come in handy. After all, our dogs need daily physical and mental stimulation! I cannot tell you how much my dogs love the KONG. 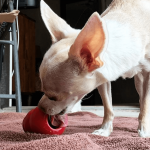 It’s a red rubber toy that has a place to hide treats. 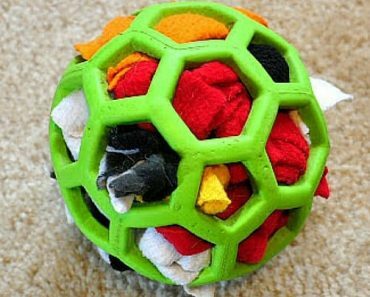 Truly, the possibilities are endless when it comes to what you can stuff your KONG with. 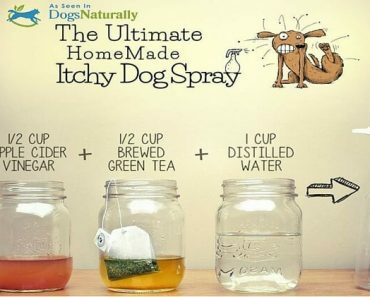 I posted this photo on my Instagram asking other dog moms what they use. The replies ranged from loose treats to liver paste and peanut butter. 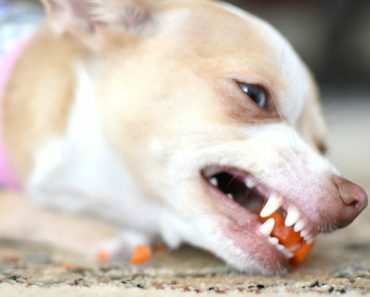 You can also stuff your KONG with healthy veggies, like carrots! 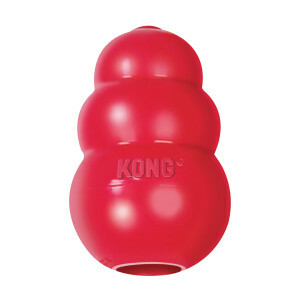 What’s great about the KONG is it will keep your pooch busy for a while. My pups work to get the treats out for upwards of 20 minutes. They lick it, paw at it, flip it around. Peanut butter and treat paste keep them busy for the longest amount of time, so if you need to keep them occupied while you do some work then I definitely recommend using a paste rather than loose treats! Another great thing about the classic KONG is that it’s super cheap! This toy comes in three sizes: X-Small, Small, and Medium/Large. Muffin Tin with Tennis Balls: Using a muffin tin, hide a few treats inside each tin cup. Then cover all of the cups with tennis balls and let your dog figure out which tennis balls are hiding a treat underneath! Water Bottle Puzzle: This puzzle is nothing more than a cut up water bottle stuffed with treats. Your dog has to paw at the bottle and spin it around to make the treats fall out. 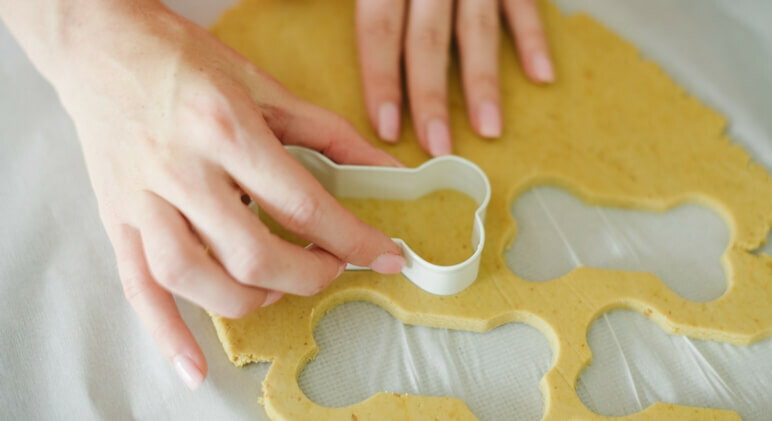 Click here to find out how you can make one for your pooch! Freeze Treats: Put your dog’s favorite treat in each compartment of an ice cube tray. Fill the tray with water and freeze. Then let your dog lick his way to the center to get the treat out! Okay, so I don’t actually own an iFetch yet … right now, my arm is the iFetch. With that said, this thing looks sooooo cool! Basically, you teach your dog to drop his tennis ball in the iFetch and it will automatically shoot the ball a few feet away. 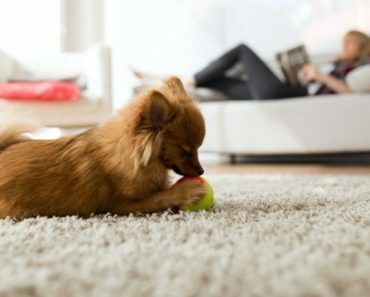 If you have the space in your house — and you think your dog would use it — then this is a great activity for rainy days. 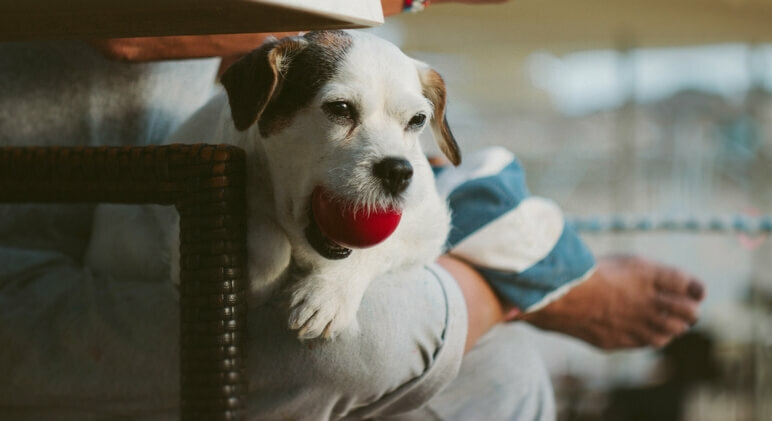 The iFetch comes in different sizes — ones that throw small tennis balls and ones that throw larger tennis balls. A short 15-minute training session every day goes a long way. Think about it – every time you teach your dog a new trick, you are mentally challenging him/her. Dogs love a challenge and they love to learn new things. If you have a new puppy, start with the basic commands: sit, stay, down, come, etc. 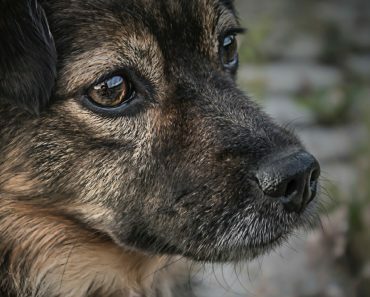 Once you have the basic commands down, move on to more advanced tricks: paw, roll over, etc. The amount of tricks you can teach your dogs is limitless. I mean, have you checked out the video of the dog who knows how to do laundry? I am a new fur baby mom. She is a bull mastiff mix. Shes 14 weeks old. Very gentle and timid. She has bonded to me really well. After being gone for 3 hours then going to bed whom by the way she sleeps between my husband and I at night. She had just gotten comfortable laying on me to go to sleep when my husband grabbed her to kiss her goodnight and she growled at my husband. I not sure how to deal with this. I scolded her said no maam but what do I do if she does it again? If she does that again, stand up, and Make your dog immediately get off of you! Make her sit on the floor. She is trying to dominate over your husband and I would make her know early on that you and your husband are the alpha in that house. Do this every time she growls at your husband. Even if you’re sitting on the couch and your husband comes to sit with you and the dog growls….immediately make the dog get off the couch and sit on the floor. Whenever the dog does something it shouldn’t, correct it immediately, within 3 seconds of the act so they can associate the correction to their bad behaviors. Amazing blog! Do you have any tips and hints for aspiring writers? I’m planning to start my own website soon but I’m a little lost on everything. Would you advise starting with a free platform like WordPress or go for a paid option? There are so many options out there that I’m completely overwhelmed .. Any recommendations? Kudos! My dog is 16 years old and in eRly stages of renal failure. He is not able to have proteins as a result. 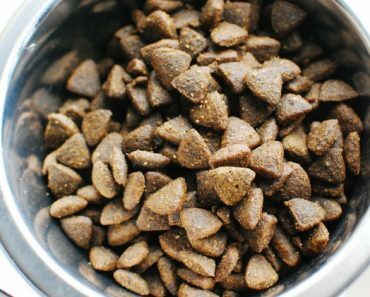 We make his treats out of tams (cut up like scalloped potatoes then dried in the oven). 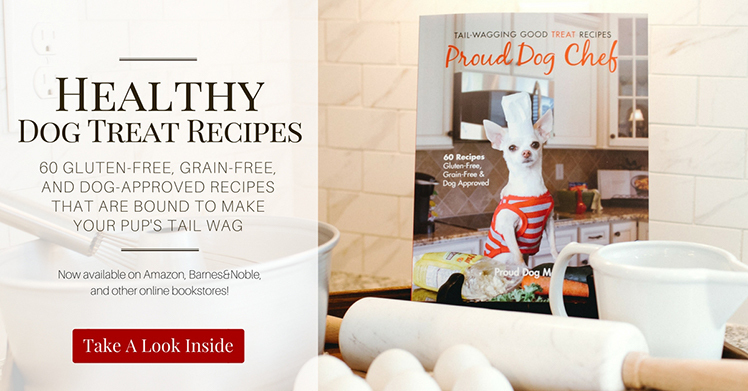 We need simple new recipes for non protein dog treats that you don’t have to bake or dry in the oven for hours on end. Can you help us?